Monique Butler, MD, MBA, brings extensive experience creating hospital operational and quality improvements. 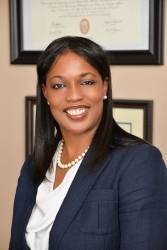 Englewood, CO, August 23, 2018 — After a national search, Monique Butler, MD, MBA, has been selected as the Chief Medical Officer for Swedish Medical Center, a 408 bed level 1 trauma center located in Englewood, Colorado. Dr. Butler has extensive experience creating hospital operational and quality improvements; and is very committed to the delivery of providing excellent care with every patient (and family) with every encounter.